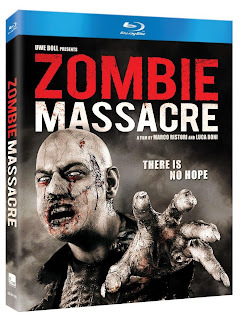 ModwildTV: Win a copy of ZOMBIE MASSACRE for Halloween While You Wait for The Walking Dead!! Win a copy of ZOMBIE MASSACRE for Halloween While You Wait for The Walking Dead!! Yes, my friends, I know nothing will truly get you through to the lazy, hazy days of zombie survival like the number one show on cable and AMC smash hit, The Walking Dead, but we have something you can have for FREE!! That’s right. Free. All you need to do is comment on this post that you want to WIN WIN WIN! Do this by August 26th and you may soon be cuddling up with someone special and covering your eyes in his chest or laughing and screaming with a crowd of your girlfriends and a bowl a popcorn. You chose the scenario, we choose the winner! I’ll compile the names of all the contenders and let an anonymous algorithm choose the winner. You’ll need to be willing to provide ME with your name and address when we contact you, so if you’re not following us, we’ll have no way to contact you directly. Here are the details on the scare-fest as Halloween comes ever closer….a review of the creature feature will follow later this weekend to spur you on to WIN!